If not, your imperfections travel with you to the workplace, possibly forming the basis for performance issues and career barriers. If you are fortunate, you have a manager who is direct and helpful in pointing out flaws and suggesting corrective action. Authors (and brothers) Joe Azelby and Bob Azelby thoroughly understand this phenomenon—as well as the fact that many people do not have this frank manager. The brothers Azelby each manage hundreds of people in a corporate environment. Their academic credentials, both undergrad and MBA degrees, are stellar. Bob as an undergrad majored in both economics and religious studies, while Joe was captain of his Harvard football team and later played for the Buffalo Bills. They also describe a rich family life growing up. Their book is the product of the earnest and complimentary collaboration of these two brothers, with their specific backgrounds comprising a pitch-perfect mix of unflinching straight talk and genuine humanity. The Azelby brothers correctly broadcast throughout their book that it is the “BUT” element that most resonate with coworkers at all levels. Nonetheless, a slight flaw is that the book’s implied mission is overambitious. Is that all? What about the legions of people who are incapable of such intensely personal insight? Many dogs can be trained to address their BUTS far more successfully than their human owners. The authors make my point. “Your bipolar antics cause everyone else to walk on eggshells, and you prevent work from getting done.” No doubt, the term bipolar is used at least somewhat figuratively. Still, many people have emotional obstacles to conquering their BUTS. Perhaps the authors know this and hesitate, one presumes to avoid muddying their message. They even invoke Kübler-Ross, noting that when your “Truth Teller divulges your ailment” you will likely experience the five stages of grief in successfully banishing your BUT. Really? Most people? Another of the book’s BUTS is the authors’ contention that the flaws they describe will invariably limit one’s career. If a large book of valued business were to walk out the door with an employee who is a miserable human being, that miserable wretch actually has firm job security. Moreover, to the extent that a difficult person continues to successfully amass ever-larger revenues, it is a capitalist certainty that his/her pay will rise accordingly and the bottom-dwelling parasite will be promoted. Yes, and all this despite the revolving door of assistants who quit due to the pathological abuse and a near-certainty that their vicious boss tortured small animals as a child. Depending on one’s industry and company corporate culture, superstar executives of this ilk may be outliers or common in an organization. It’s probably safe to assume that the authors know all this, but again chose to exclude exceptions to maintain the flow of the book and its crystal clear and sensible points; however, if you report to a highly obnoxious and insensitive manager/rainmaker, by all means, after reading it, leave the book on this person’s chair. If you are lucky, this could make a difference in your daily life. If not, authors Joe and Bob would suggest you try to find a new boss. Kiss Your BUT is a quick read, and so easily digested that this is perhaps the cause of the last of this book’s BUTS. Yes, the book is clear and comprehensive, BUT it does bog down to some degree with repetition as well as in cataloging virtually every imaginable poor workplace behavior. Long before the book ends you will have gleaned its takeaways. In their introduction, the brothers note “Thankfully, we did not read this book to make money. Very few people can make a living writing, and we are extremely confident that we can’t, either.” No doubt Joe and Bob are spot on. They did not write a perfect book. They should hang on to those day jobs. Despite its BUTS, Kiss Your BUT merits far outweigh its imperfections. This book will be useful for many of its readers in addressing barriers to career success. Taking this a step further, the BUTS that travel with people to the workplace may also bedevil relationships and life outside the office. 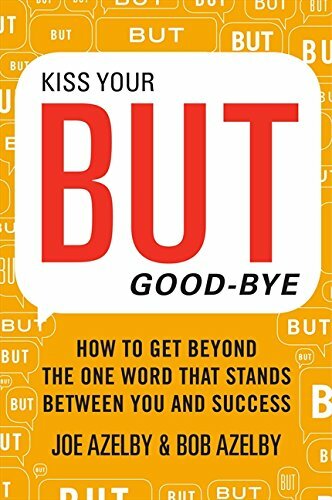 Readers who fix their in-office BUTS may find that the positive implications spill into other quadrants of their lives, poignantly supplementing the book’s overt workplace mission.